You are here: Home › Shipping Containers › Painting a shipping container – PLUS useful tips. When it comes to shipping container painting there are 3 colour codes we frequently get requests for – RAL 6007, RAL 5010 & RAL 9001 (which are green, blue and cream respectively). Although these colours are very popular we can re-paint a container in any colour you wish. What is an RAL code? RAL is a colour matching system and each code refers to a particular colour. Around 250 classic RAL colour codes exist, so there’s plenty for you to choose from. Here’s an external link to ralcolour.com which gives a full rundown of colours (do bear in mind that the colour displayed on your screen may differ slightly from the actual colour, depending on your screen resolution). Before a container is re-painted it should be cleaned down, this is standard practise for any container we re-paint for you. Depending on your needs there’s also another option for re-painting which includes shotblasting. 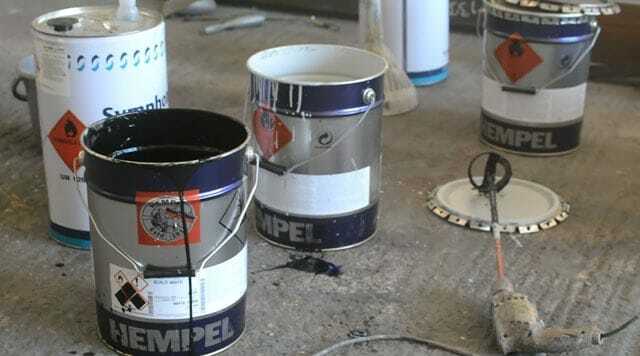 The container is shotblasted to Swedish Standard SA2.5 (near white metal) and primed with zinc rich primers – which is more or less like metal spraying. There is an ionic transfer between the steel and the zinc – which helps to prevent corrosion when properly applied. Is the extra expense of shot blasting really necessary for you though? 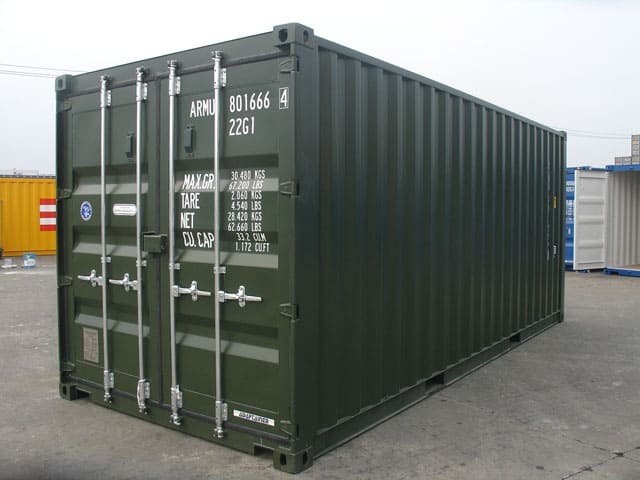 Containers are manufactured to be used in harsh marine environments using expensive coatings and corrosion resistant steels. 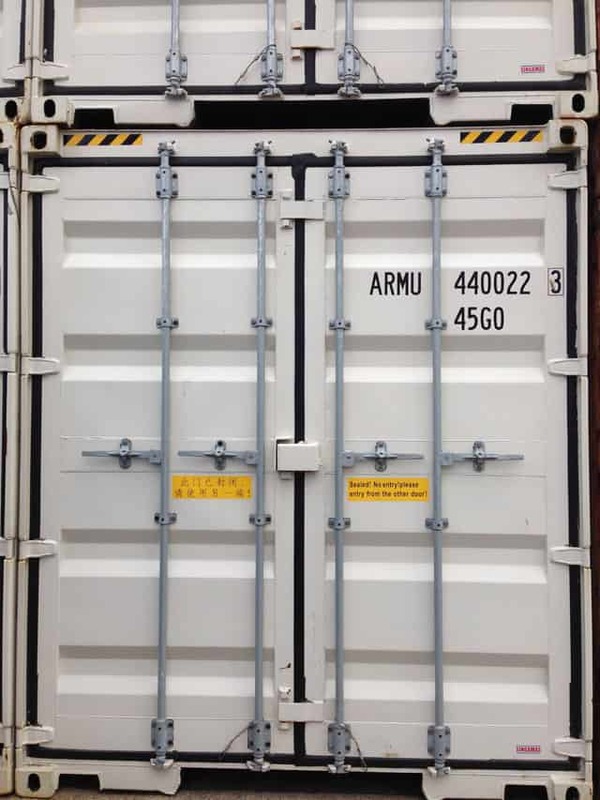 Freight containers are normally manufactured using “Cor-Ten” type steels, these are copper enriched which helps fight against corrosion when the paint is damaged – the box “self-heals” during oxidisation and inhibits corrosion creep. When balancing up the difference in cost between cleaning the container down and re-painting, versus additional shot blasting and priming we would generally recommend starting with a good used box and just over-coat for a durable performance. This is standard practise in the market, unless of course extra durability is paramount to you (think bigger budget conversion projects for example) and initial outlay is not the only main consideration you have. Because the container market is so competitive it has been known for some manufacturers to cut corners on materials. In the case of paint this could be the amount of pigment incorporated which is why some containers appear “chalky” after several years exposed to sunlight. This does not necessarily affect their ability to resist corrosion though. Another point to watch out for is the microns of paint used by the manufacturer (thickness of paint). 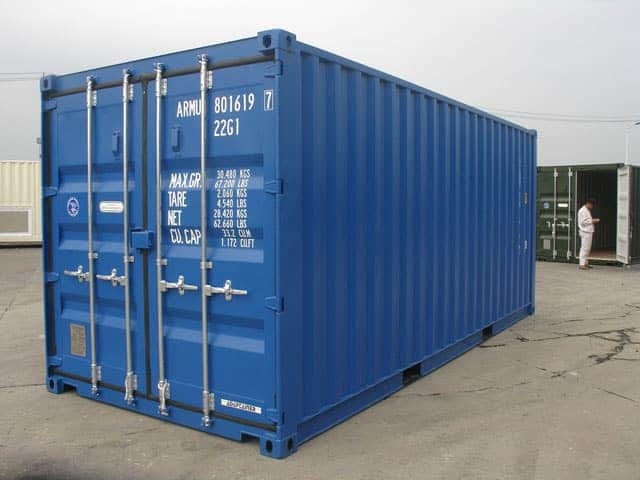 A container manufacturer can save money by using less paint, the problem this causes for you is that paint helps protect against corrosion – so the less paint used, the less protection you have against corrosion. Applying a coat of bitumen (oil based substance) to “new” container roofs does no harm whatsoever, you could apply this yourself – perhaps with a roller. The under-structures are normally protected with a thick application of bituminous paint. This helps to repel rain water from air turbulence affecting the underside during road transportation at speed. Due to environmental concerns the market is switching towards water-born coatings. Marine paint manufacturers are confident that performance will approximate that of solvent-born coatings that have been more commonly used in the past. Which container colour will you choose? RAL6007, RAL5010 and RAL9001 are best selling colours, but which colour will you choose?